5.The people are affected by asthma, rhinitis, pollen allergy, respiratory diseases and other troubled home. 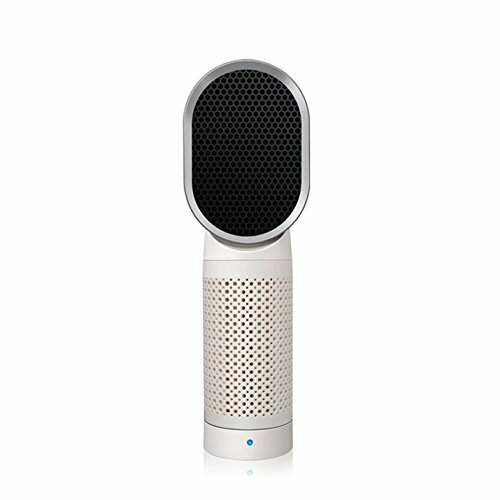 BRING YOU A BREATH OF FRESH AIR This is a great solution for those suffering from asthma and allergies, as it removes 99.97% of the particles that trigger attacks. It's great for light odors, light chemicals and smoke removal. PRE-INSTALLED CARBON FILTER, EXCELLENT PERFORMANCE : Carbon filter targets finer particles (PM2.5), including pollens, animal allergens, bacteria, and mold.The provided filter is suggested to be replaced every 6 months for efficient air purification. IONIZER PURIFIER : Negative Ions bind with airborne smoke, dust, and pollen to form larger particles that are more easily captured by the filters. When turned on, the Ionizer will make a soft, but audible, crackling sound. SUPER QUIET, ADJUSTABLE SPEED: Features a silenced low noise technology makes it suitable for use both day and night without disturbances around-the-clock protection. The unit adjusts to your air-cleaning needs-lower when you are sleeping or working and need quiet, higher when it's prime pollen time. 100% CUSTOMER SATISFACTION Limited life time warranty, if the item have any quality issue, please free feel to contact with us. If you have any questions about this product by IREALIST, contact us by completing and submitting the form below. If you are looking for a specif part number, please include it with your message.